Now when they heard this, they were cut to the heart and said to Peter and to the other apostles, ‘Brothers, what should we do?’ Peter said to them, ‘Repent, and be baptized every one of you in the name of Jesus Christ so that your sins may be forgiven; and you will receive the gift of the Holy Spirit.For the promise is for you, for your children, and for all who are far away, everyone whom the Lord our God calls to him. For the promise is for you, for your children, and for all who are far away, everyone whom the Lord our God calls to him.’ And Peter testified with many other arguments and exhorted them, saying, ‘Save yourselves from this corrupt generation.’ So those who welcomed his message were baptized, and that day about three thousand persons were added.They devoted themselves to the apostles’ teaching and fellowship, to the breaking of bread and the prayers. I returned from Cuba a few days ago where I spent some time teaching at the Methodist seminary in Havana and preaching in a Methodist Church in a municipality of Havana named Guanabacoa. This was my eleventh trip to Cuba if I have counted correctly. When I come home I tell people that every time I am there with my fellow Christians I feel as if I have been inserted right into the New Testament book of Acts. The Methodist Church in Cuba is growing in numbers and in depth of discipleship. The same is true for a couple of other Protestant denominations, but my familiarity with Christianity there is Methodism. The church finds itself in the midst of a difficult and sometimes rather hostile society, and yet the numbers being added to the church daily are incredible. Lack of freedom has not hindered the mission in the least. Worship services are full and in more than a few places people are standing outside listening in through the windows. The churches meet regularly for worship, prayer, and healing, and the church is singularly focused on witnessing to the gospel in word and in deed in order to make disciples of Jesus Christ. The church in Cuba is outwardly focused in its mission. When I ask pastors what is their greatest challenge, it always has something to do with their ministries; they never mention personal challenges, though they have many. The church in Cuba is poor and yet they give sacrificially. They experience great scarcity, but they focus on their abundance. My experience with the church in America is that we have great abundance, but we are always bemoaning our scarce resources. Their interest in new converts is not so they can pad the coffers. People are not a means to an end; rather they are ends in and of themselves– people loved by God who are in need of Jesus Christ. There is a contagious vitality present in the Methodist Church in Cuba. It’s compelling. There are no gimmicks to increase attendance, no advertising blitz to get the word out. Churches and individual Christians are simply living out the gospel in the communities in which they find themselves. God is doing great work in Cuba because the Christians are simply willing to be used by God. And it won’t work to say that the people are attracted to religion because they have nothing else. There is no opiate for the masses here. After the Communist Revolution, the church languished for almost thirty years, poor and destitute just like everyone else in Cuba… and in decline. But something began to happen in the late 1980s. The Christians decided it was time to quit putting their trust in new and different programs, and start trusting in God. They began praying, and I mean really praying… all night prayer meetings and round-the clock gatherings. They also began to fast regularly. Moreover, they knew that the only kind of disciple of Jesus Christ that could be used of God in mighty ways was the disciple with, what Bishop Pereira of the Methodist Church in Cuba refers to as, “the burning heart.” “If your heart does not burn, no program is going to fix it.” The church does not need admirers of Jesus; it needs real followers. Moreover, when one sees where new congregations have sprung up in Cuba in the middle of nowhere, it cannot be said that a church is in decline because of its location. People are coming from all over to worship in far away and isolated places. It’s that burning heart thing again. Yes, when I am in Cuba, I feel as if I have been inserted into the book of Acts. At times, I almost think that I can turn around and see the Apostles Peter and Paul standing there with me. But that is not the case. The reason Cuba feels like the book of Acts is because the same Holy Spirit at work in the early church is at work in mighty ways in Cuba in the twenty-first century. 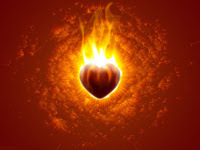 The flame of the Spirit is alive and burning in the hearts of the believers. One of the district superintendents of the Methodist Church in Cuba says very often that “the best is coming.” He believes God has much more in store for the church there and its mission. The believers there look forward ready to participate in what God will do. They anticipate in hope what will happen in the days ahead, instead of longing for the way things used to be in the days of yore. They have embraced the words of St. Paul “that no eye has seen, no ear has heard, and no human heart has conceived what God has prepared for those who love him” (1 Corinthians 2:9). Yes, the Methodist Church in Cuba faces its own set of challenges and difficulties, but they are focused on what God is doing in the present and where God is leading them in the future. Even though they exist in poverty, they live in the kind of abundance that can only come from the Gospel of Jesus Christ. You hit the nail on the head. I was in Guanabacoa when they were rebuilding the church. Talk about a church on fire. The whole Christian nation is in a revival.